For various reasons, the past years and especially last year I have traveled a lot solo. This way, I’ve had the privilege to travel regularly during the weekdays and off peak season. Making it cheaper and less crowded than in the weekends and peak seasons. I’ve also been able to tweak and adjust it like only a solo traveler and hustler can. In other words, there’s many benefits of solo travel and the freedom I have. Yet, I have to admit many times it’s damn demanding and tiring to be in charge of everything myself. To make all the planning, execution, hustling and figuring out all by myself. No extra pair of hands available to give a helping hand when needed. No extra pair of eyes looking after things needing looking after. And especially, no stupid jokes in every possible occasion. And the only possible solution for pictures of yourself are the selfies. All this said, I have luckily figured out few tricks which makes traveling solo a bit more easier and pleasant. Especially when it means traveling for skiing and other activities, when traveling with many heavy bags and hangry moments. And for the nice person I am, want to share them in here. With this stupid selfie from my Davos trip last week. Get good bags for your toys. Like, really good bags. The handy robust ones. The ones with wheels and/or possibility to carry them in your bag/shoulder and the ones with as little extra weight as possible. (Extra points for good looking and recognisable bags). You’ll really thank yourself when you haul them into the trains through crowds and long staircases and icy roads. My choice for my skis: Douchebag. Figure out where to storage your stuff, well in advance. For example, if you don’t get into your accommodation or don’t stay in the destination for the night you have to have secure place for your stuff, as your mom or no one else is looking after them. Figure out where’s lockers and at which size and with which price, and how long the storages are open. 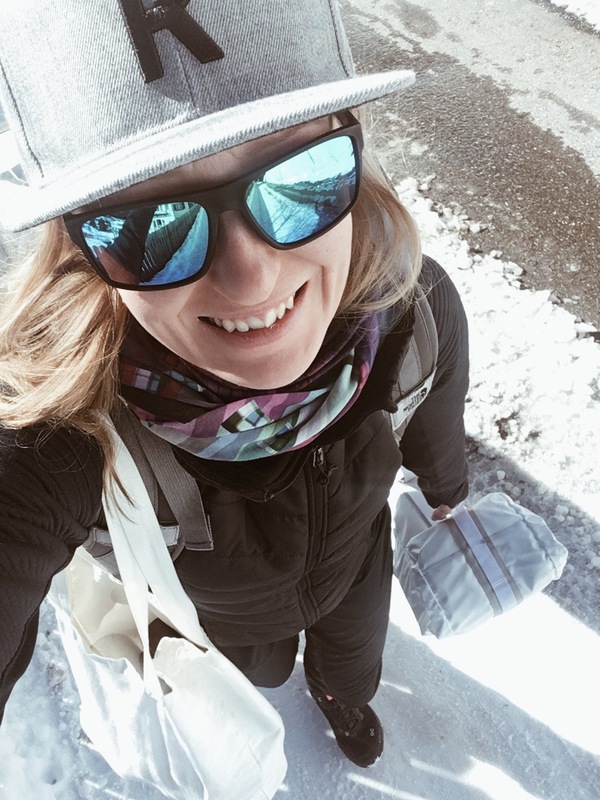 As a skier/snowboarder/whatever, you can never travel light and you most likely will have some stuff you don’t wanna carry along all the day. Get used to being ok eating alone and finding out the good in it. When googling where to eat, check for recommendations for single eaters and really go for the things you really like. When solo, you don’t need to worry of the friend only eating still living stuff nor the other highly allergic to chili. 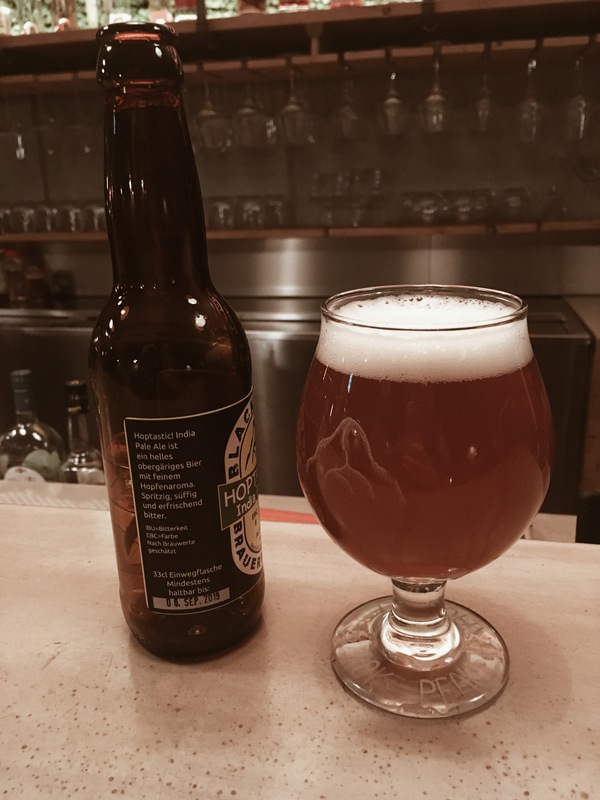 On the other hand, you need to be happy to be squeezed into communal table or get a seat only from the bar. Yet, there’s the good in that too: you easily get to chat with the staff, get very personal service or alternatively can just concentrate on your phone or book or food or beer or the other guest. 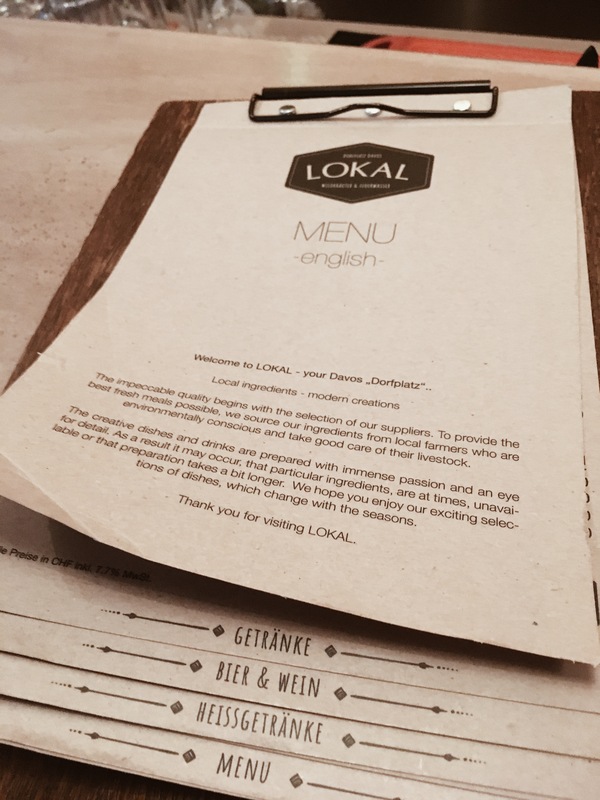 My restaurant recommendation for Davos in the pics: Lokal. Get used to not getting the best accommodation if and when you don’t have limitless budget. Unfortunately, the single tax – higher price if it’s just you in the room vs. two person sharing the room – is still exciting in many places. Also, very few places have good deals for solo travelers, even though the trend is picking up the businesses too. So, if and when you’re not into paying 200,- for a hotel room, you have to stick to the hostels most of the times. Nevertheless, if you are also interested to combine i.e. spa or sauna or other activities into your trip, have a look at how much the hostel bed + local spa visit costs separately bought and compare it to the best rate to a room in a spa hotel. Alternatively, keep an eye on the camps and similar, in where you end up being one solo traveler among many other solo travellers. Might get you surprised. And, if you’re going for the hostel and especially in Switzerland, check the Swiss Youth Hostels. 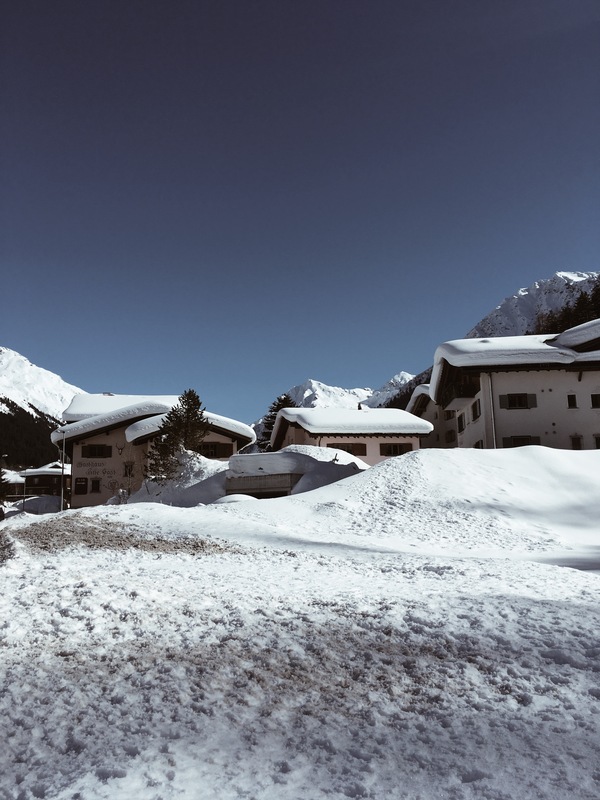 There’s a hostel in almost every best mountain destination, some of which with very good views and breakfast and the whole thing focused on sustainable business. For the transport, skip the car and take the train and/or bus. Roadtrips are super nice, but especially when traveling solo you most likely want to stress less of finding the right way and parking place, and of the traffic conditions in the foreign place etc. Also, sitting in the car all by yourself is not really good for the environment. So, let’s skip that. And then in the train and bus, try to be there well in time to secure the window seat. It’s way nice to look out from the window or lean your head to the window when napping, than do the same to the stranger sitting next to you. In Switzerland, Swiss Travel System is my more than recommended transport method, for solo travellers especially. That said, look at how happily I enjoy my daily exercise in the pic above. Dragging my two pairs of skis and boots and other heavy luggage uphill in over 1500 meter above sea level. All the way up to my hostel behind the steep uphill, after not being wise and going directly from the train to the Langlaufzentrum Davos, to keep my stuff there while waiting for the hostel to let me check in and doing my first cross-country tour of the visit. My solo travels doesn’t always go as smoothly as I would like to. But most of the times they are still more than worth doing. 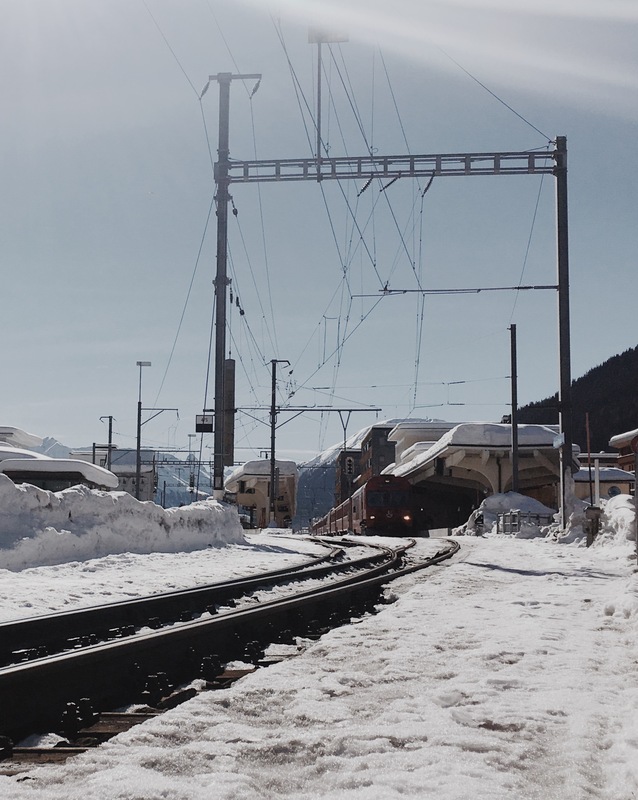 Start the tour from Klosters Arena (second pic, few hundred meters from Klosters Platz station) or first take the train all the way from Davos (the first pic). 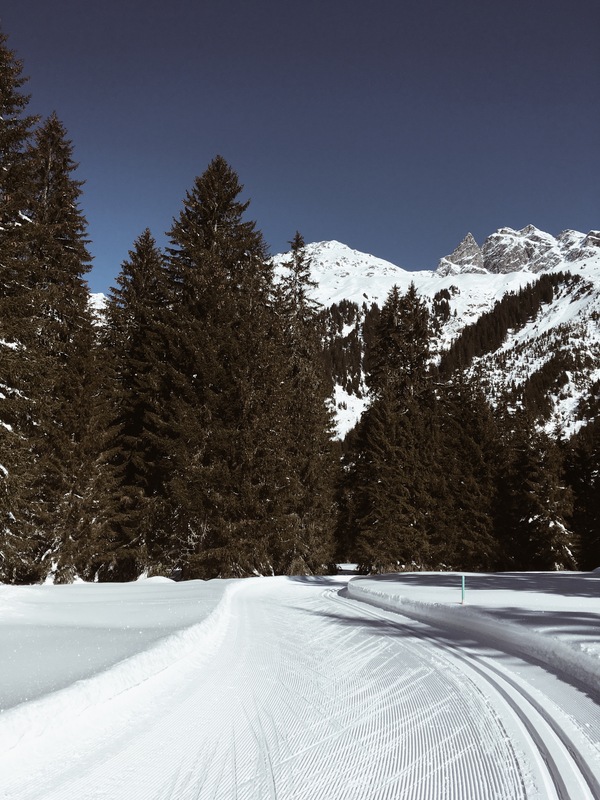 From Klosters Arena, you find a small cross-country skiing center with WC, changing rooms, showers and lockers (works with 5CHF pant), and the official starting point for the cross-country tracks, with information boards and signalisation. 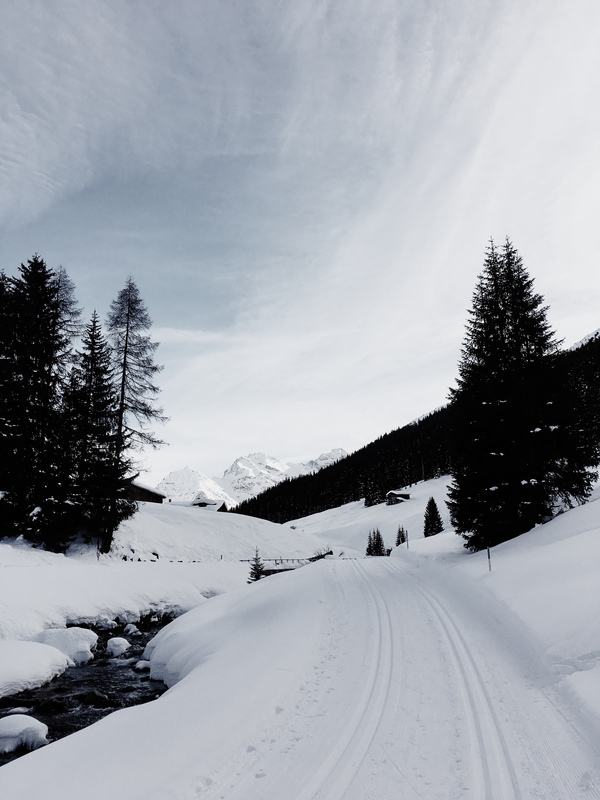 Then, just hit this amazing cross-country skiing track (both for skating and classic style) up to Alp Novai. 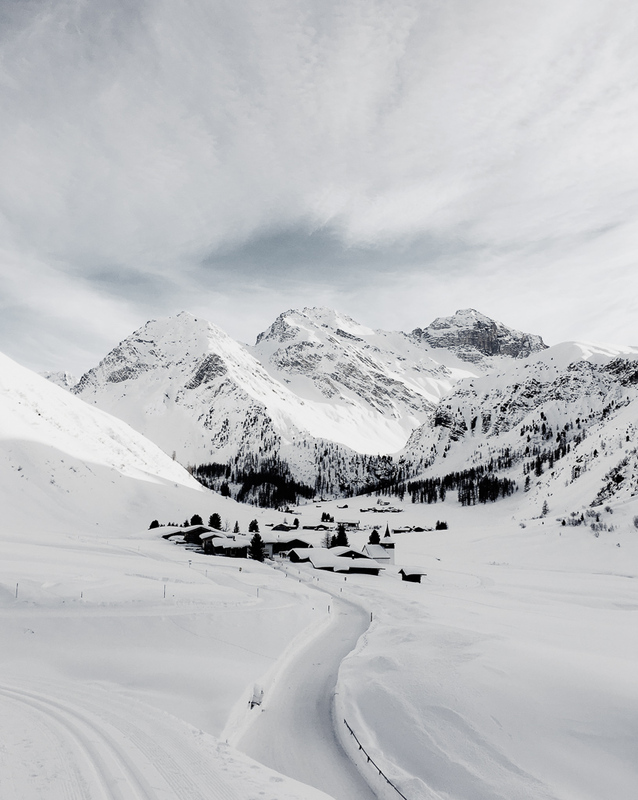 Continue all the way up, in the wide valley along the river, between mountains and the famous peaks of Piz Buin and Silvrettahorn in the back. Stop by for snacks (your own) in Alp Novai, or for proper lunch and break in the sunny terrace of the restaurant in Alp Garfiun. 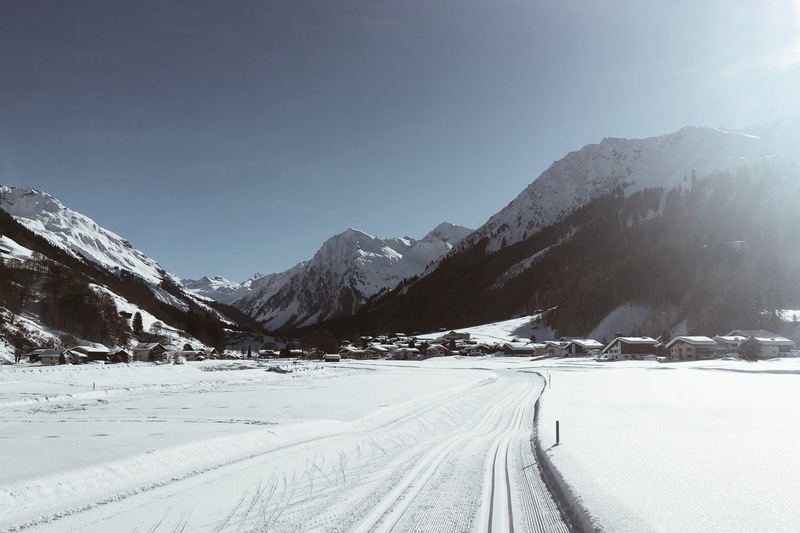 Finally, slide easily back to Klosters, to continue the day whatever way you like. 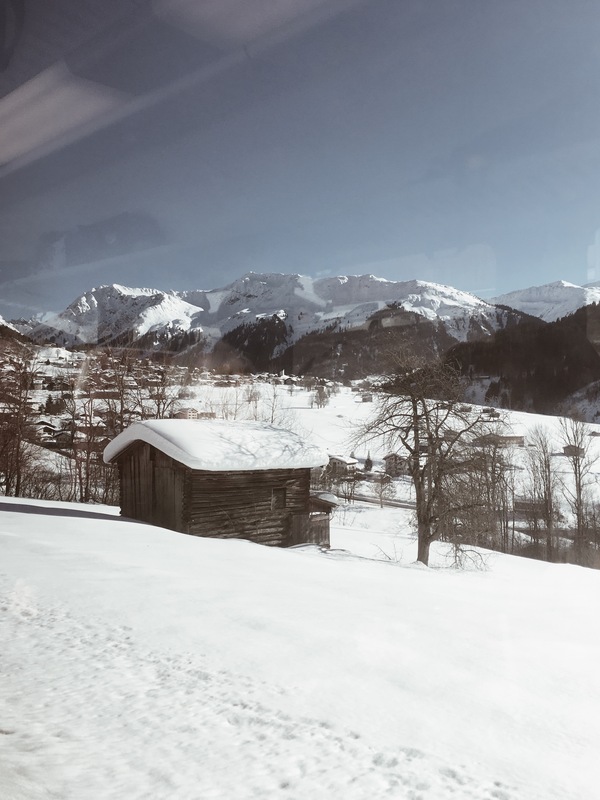 After my tour last week (Strava says 16km from Klosters Arena (1191m ) to Alp Novai (1363m ) and back, with elevation gain 289m ) I took the train from Klosters Platz back to Davos Platz, and made another magnificent tour, more of which in here. In the end, this was a loooong day. But definitely worth the effort. 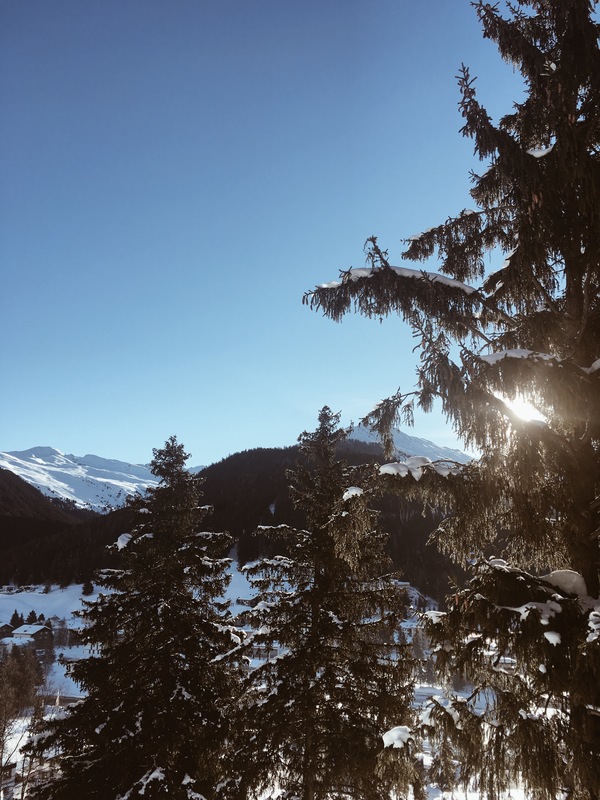 Note: Many of the cross-country skiing tracks in Davos-Klosters go in the valleys, many of which lined with steep and avalanche prone mountain faces. 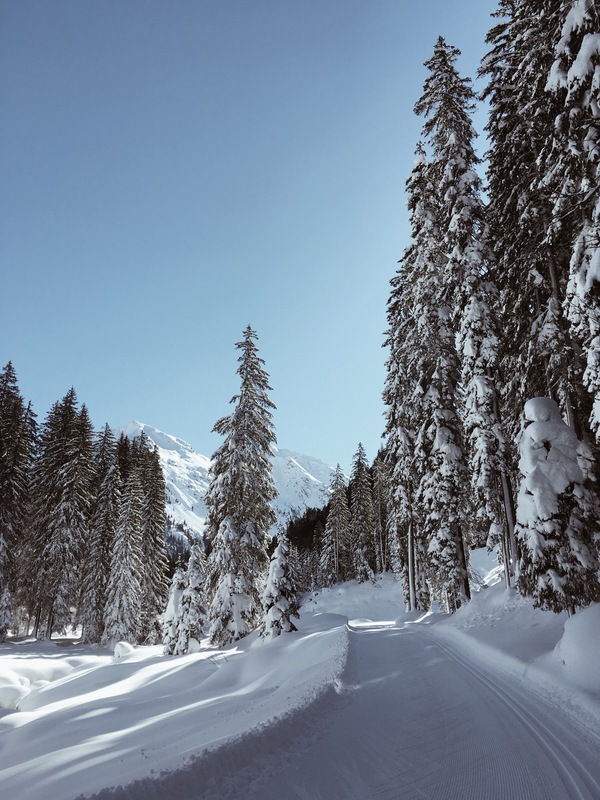 Therefore, before taking the train and heading to ski in Davos or Klosters, check the weather forecast and other current information for the open tracks. Information can be found in here or in the info boards on the cross-country and village centres in the area. Psst: For the hungry skiers, there indeed would be an excellent mountain restaurant in Alp Garfiun (1373m) for käseschnitte, beer etc. 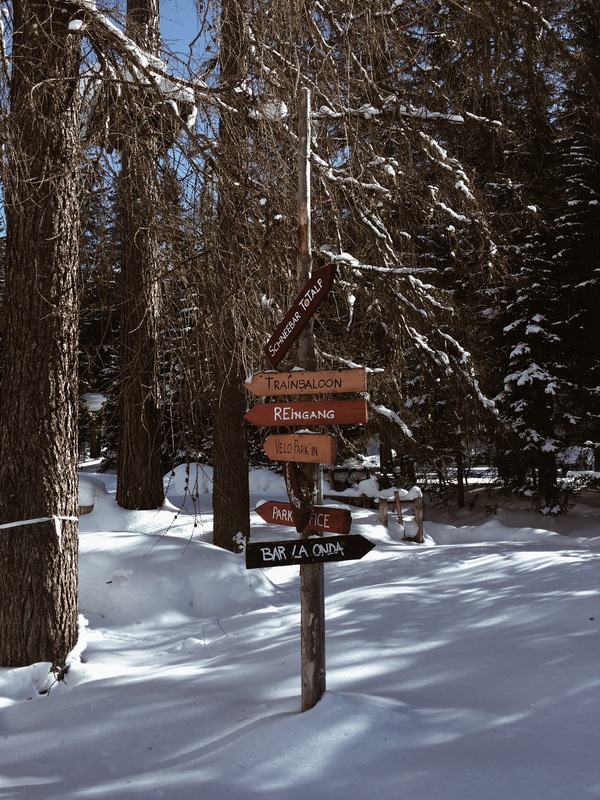 Yet, be careful as it’s very popular lunch place – right by the cross-country skiing and winter walking tracks – as you may need to wait for a table quite some time. When I arrived here last week, there wasn’t any single spot left for me to sit down and enjoy käseschnitte (would have been well earned after the 8km uphill) and the excellent mountain views from the sunny terrace while resting my well worked muscles. Though, with this fail I was “forced” to enjoy my (fast visit to Coop on my way to the station) lunch in the train back to Davos. Saving precious minutes to do another long tour the same day. 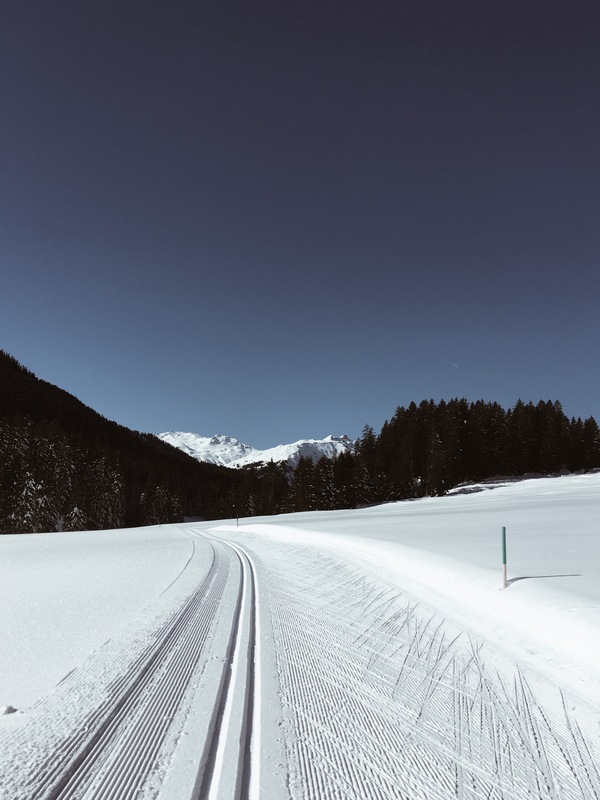 Perfect tracks are made to be skied, right? 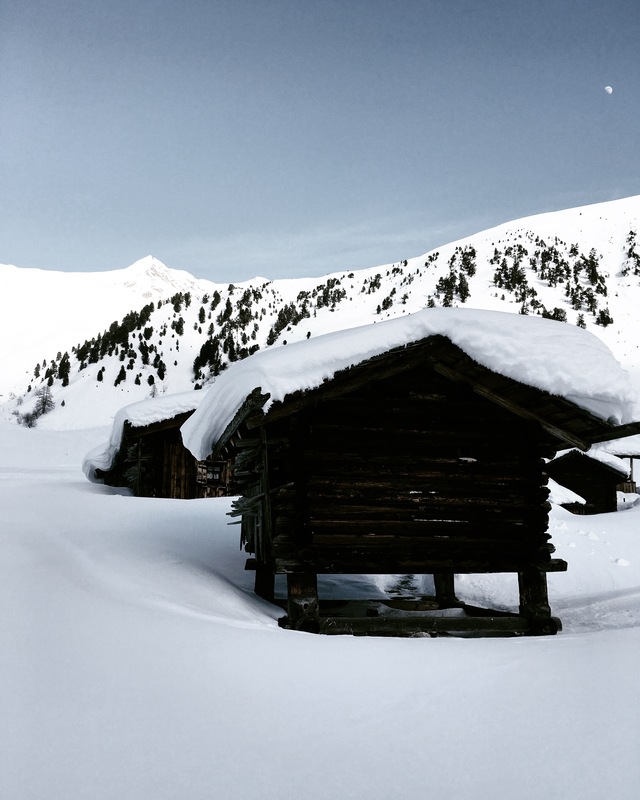 On my second day in Davos last week, I got this crazy – yet very familiar to me – idea to go ski the Sertigtal-loipe. From Davos Platz (1540m) to Sertic Sand (1859m). Classic style, the more demanding one on uphills and the only one allowed on this specific track. Please note, on that day I had already skied up to Alpe Novai from Klosters (more of that later). Of which the first about 8km is uphill. During which trip I also missed a free spot in the restaurant Garfiun and was further on living on Coop lunch and puhti-shots… Oh yes, it was a crazy idea then. Too much sun maybe? But when in Davos, you do as much as awesome things as possible and perfect tracks are made to be skied. 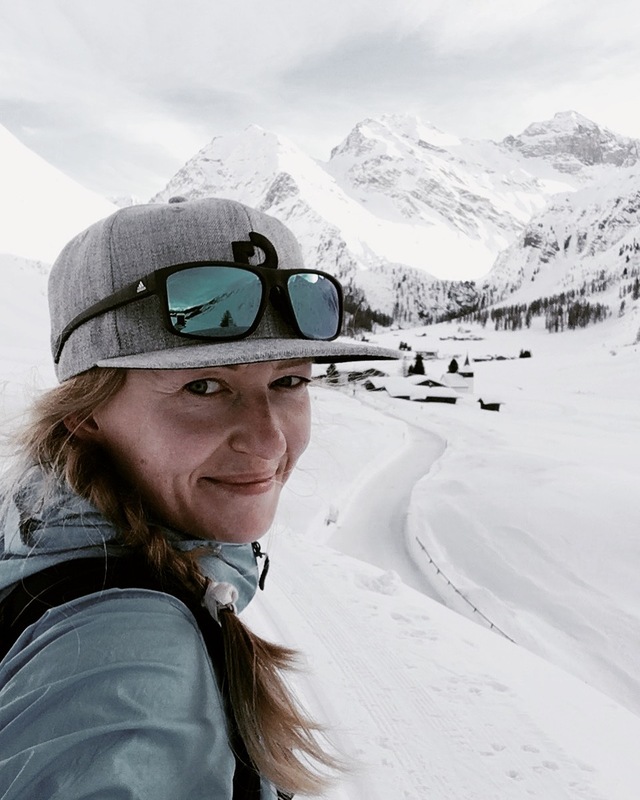 And since I had the gear on and the weather was perfect and the train back from Kloster to Davos stopped conveniently in Davos Platz (the perfect starting point for the sertigtal-track) and there was still 5h to even the earliest of dinners, I decided why not. In the end, I have to say I should have considered further how the during the day very sunny track in the Sertig valley going with the name Sertig-Loipe, with a slight incline almost all the way from Davos Platz (1540m ) to Sertig Sand (1859m), would be in shadow in the afternoon. Meaning freezing tracks and not the best grip for not the best skis (sponsors, you may contact me by email;). Nevertheless, I made it and now I am more than happy I made it. According to my Strava, 21.9km and 516km elevation gain, with max elevation 1872m. Maybe it wasn’t so bad idea to not consider it further after all. Like my marathon idea, kind of… Best when not thought of too much beforehand, yet just enough to consider it safe and yourself capable of doing it without harm. And then just doing it. Glad I made it, especially because it was one of the most beautiful, if not the most beautiful cross-country skiing tracks I’ve ever skied on. First up from Davos Platz to the Sertig valley itself. In the valley, the track then follows first the wild Sertigbach stream and then the Felabach stream, continuing all the time with the slight incline past Sertig Mühle and numerous remote Walser settlements, before reaching the highest point of the track (1864m), cute Sertic Church in the pics (built in 1699) and finally Sertig Sand (1859m) with restaurant Walserhuus and Post Auto bus stop for the ones not into skiing all the way back as well. 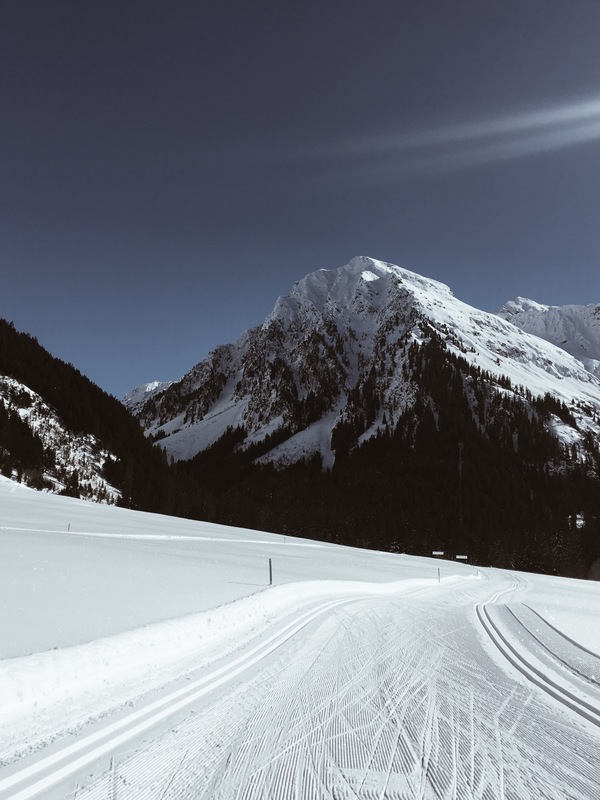 Extra tip: when reaching the end of the track in Sertic Sand (cute and remote village with majestic Mittaghorn, Plattenfluh and Hoch Ducan in the back) take the post auto back to Davos Platz. You can also ski down the same track you came up on, but. 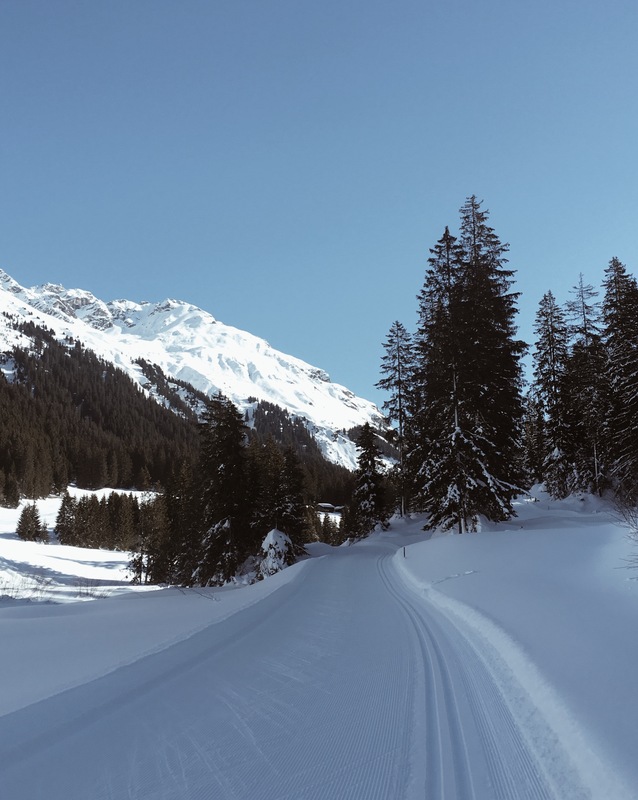 Since long downhills with classic skis aren’t the most enjoyable activities of many – especially on a bit too icy afternoon tracks in the shadow – I highly recommend the Post Auto (= bus), which runs regularly between Davos Platz and Sertig Sand. 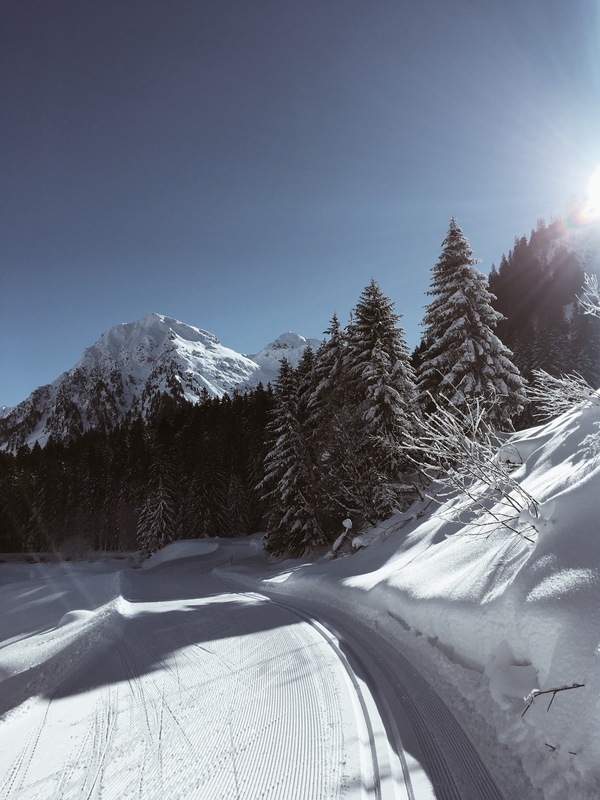 At the end of the uphill, you may even wait for it in the Walserhuus restaurant, eating and drinking well after earning it all on this excellent track.